Successfully Added Lightweight Windproof Anti-collision Helmet with Goggles Military Shooting Helmet Paintball Face Mask to your Shopping Cart. 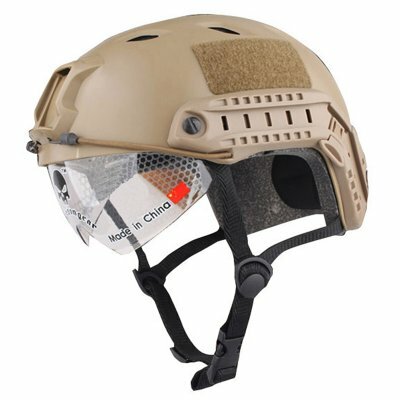 Material: The tactical helmet is made of hybrid engineering plastic, strong impact resistance, not easy to damage, durable, and can effectively protect the head. Multi-function Parts: equipped with practical card slot and guide rail group, can firmly fix the dump truck package, flashlight, signal lamp, earphone bracket and so on. Magic Tape and Goggles: A large number of magic tape behind the tactical helmet, can wear camouflage, hidden goggles with the tactical helmet can fully cover the eyes to prevent squinting in the sandstorm weather. Internal Buffer and Chin: The lining has an impact resistant and memory foam layers, and the jaw holds that the helmet is fixed to your head, those can effectively minimize the damage when you receive a shock. Application: The Helmet is great for training, search and rescue, climbing, CQB, shooting, paintball, skirmish game, hunting use and other outdoor activities. Lightweight, multi-impact, ventilated liner with impact pads. Goggles with the tactical helmet to protect your eyes.